Growing up in the 1980s, one of the things I remember most was a sense of optimism. Optimism about the future, and in particular about how technology would shape our lives in the future. This, as most Aussies will attest, while tuning in for this enormously popular technology show each friday evening, was what we were sure the future would be like. Whether or not the show’s host, Amanda Keller, would still be wearing such an awful skirt and oversized coat in the future, was up for debate! But one thing was certain – having your own personal robot was going to be a big thing one day. Robots had already been part of popular culture for decades, prior to the 1980s. Particularly thanks to films and TV shows about the future, in which robot assistants were pretty much de riguer for any self-respecting sci-fi show or movie. And many of the early Japanese tin-toy robots were inspired by the old sci-fi of the 1950s and 60s, and today are considered extremely valuable to robot toy collectors. 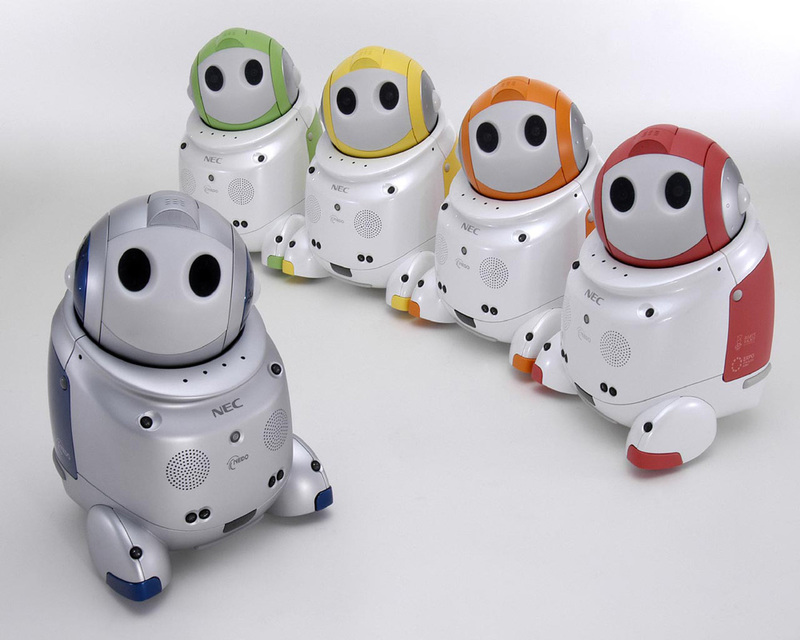 Japanese company Tomy obviously loved the idea of cute and friendly robots too, and set about creating a line of sleek, white, plastic, electronic robots that I think really captured people’s imaginations, and were a worldwide hit (judging from the number that were made). 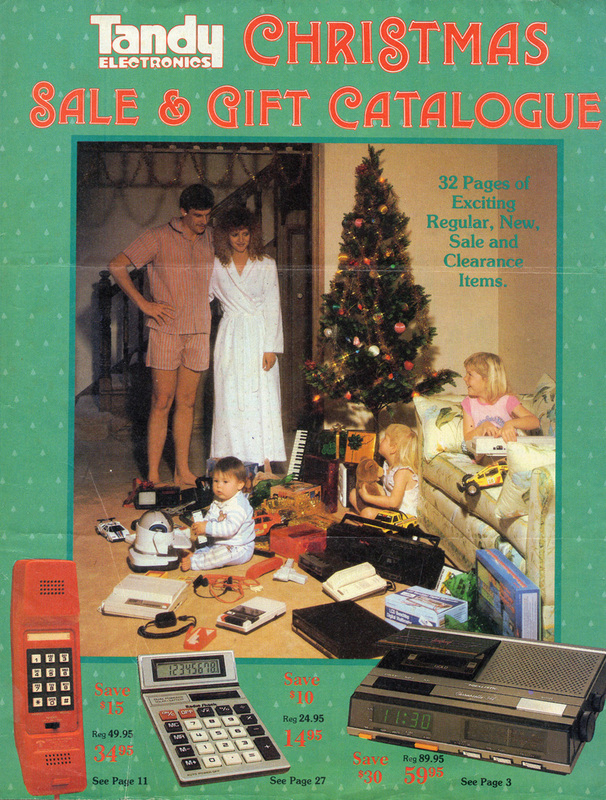 The interest has continued to this day, with many enthusiasts collecting these 1980s models, and a special mention goes out to the website www.theoldrobots.com where you can find a little info on just about every single model and variant ever produced. One of the first of these that I ever saw, was of course the subject of this article – Robie Junior. Radio Shack / Tandy had decided to license and rebrand arguably the cutest of Tomy’s creations (known in Japan and elsewhere as the “Omnibot Junior” and most likely released a year or so earlier under that name), and make it seem even friendlier (calling it “Robie” – a mix of Robbie and Robot). 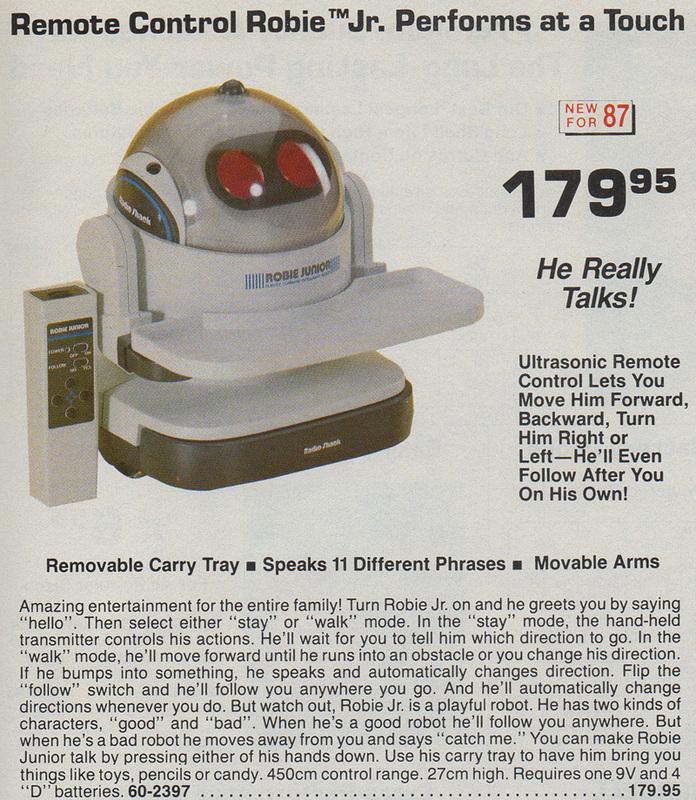 Billed as advanced personal assistants as much as amusements, the first thing I remember about the Tomy robots of the 1980s were how expensive they were – even their prices seemed to be from the future! As a 10 year old, AU$180 was well beyond my reach. And to put it in perspective, $180 in 1987 is about the equivalent of AU$400 today. And not only were we kids of the ’80s less likely to be spoiled with pocket money than the kids of today, how many of today’s 10 year olds do you know who have $400 cash to drop on a single toy? Not that I felt the price was too dear. Back in 1987, it seemed to me that a moving, talking, object-carrying robot was worth every cent. After all, you were basically buying the future. We would all need robots one day. It was inevitable. …and let’s face it, Robie probably had more functional abilities than that baby! 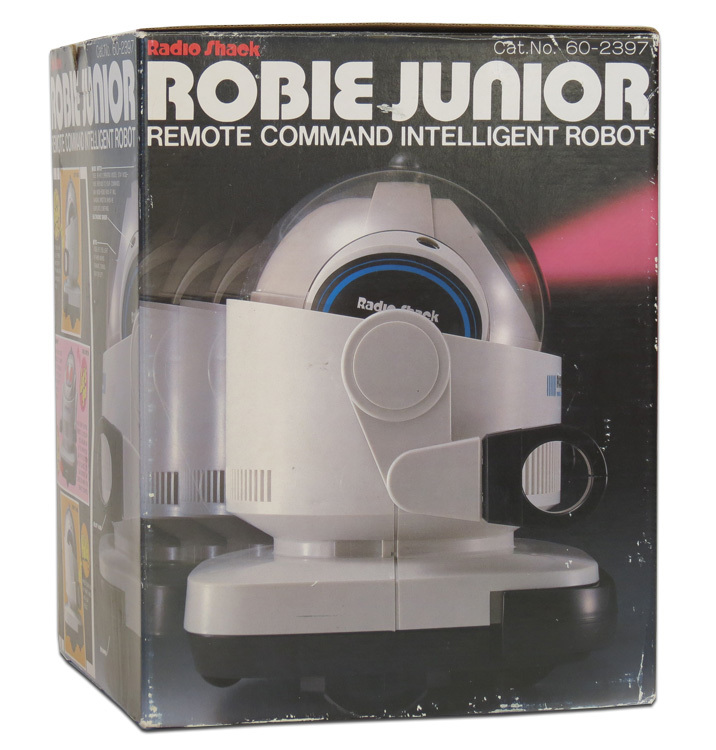 An advanced toy robot like Robie Junior seemed as if he’d add a new dimension to the standard Christmas fare of RC cars, action figures and electronic games. Here was a toy that could follow you around, talk, and even work as a household butler to impress visitors. At least, that was the idea. The box came adorned with life-size front and side images of Robie – I suppose to leave you with no illusions about the size of the toy inside. Inside, Robie came in a plastic bag and was supported by cardboard dividers. He came with a remote control, carrying tray, and an owner’s manual. I, for one, was quite ready to welcome our new robot overlords back in 1987 (especially if they looked as cute as this). 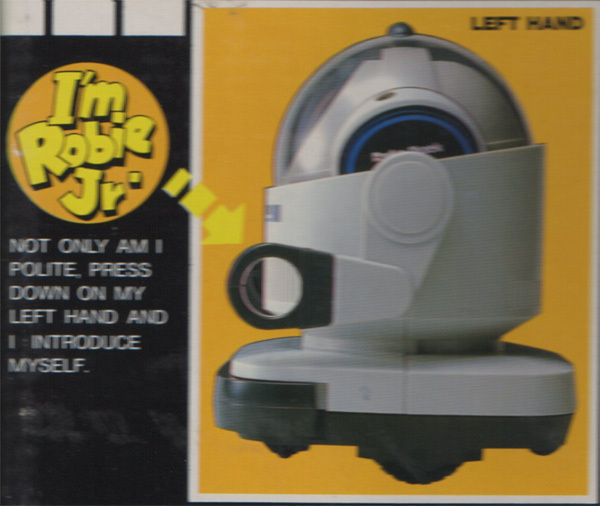 In fact, Robie Junior was a mid-range robot among Tomy’s impressive line-up of toys – and not the one most likely to sneak around the house at night. As much as I imagined he might. 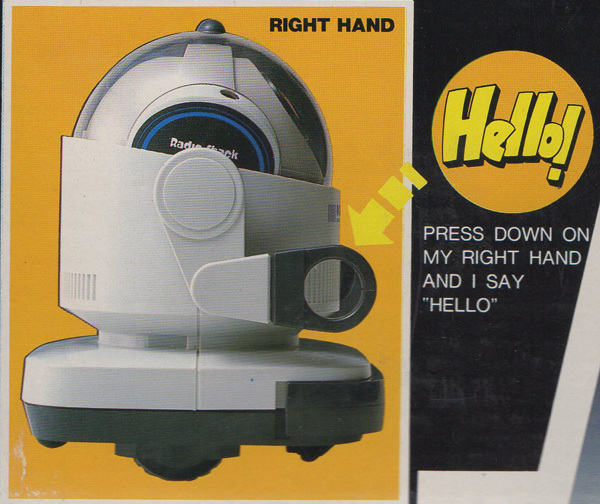 At the top end of Tomy’s line was another more advanced robot called “Omnibot” – he was about twice the size (and price) of Robie and could even be programmed to remember specific functions and operate at specific times of the day. 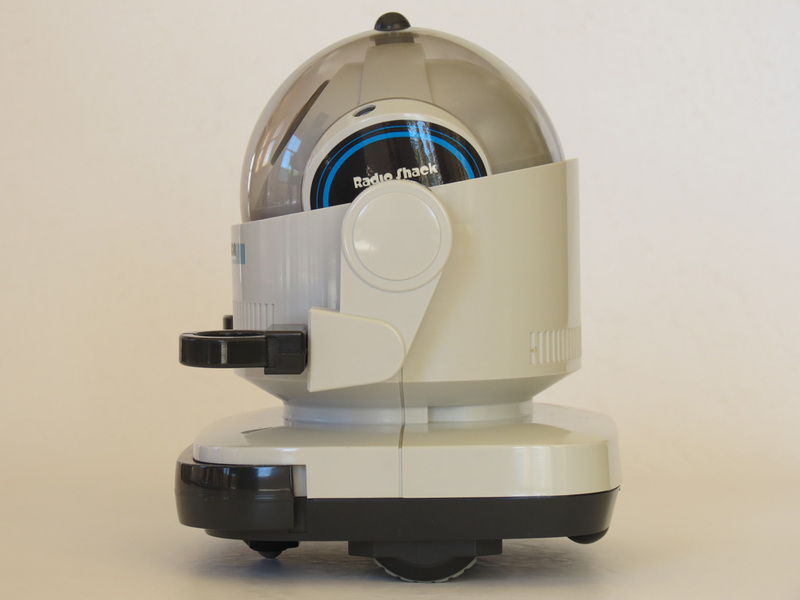 At the more affordable end of the line were Tomy’s tiny robots like “Dingbot” and “Flipbot”- motorized little characters that would run around on your floor by themselves and perform simple tricks. Tomy also had some semi-sophisticated models with specific cool abilities – such as “Verbot” and “Chatbot”. (Don’t worry, I’ll be covering all these classics in more detail, in the future). 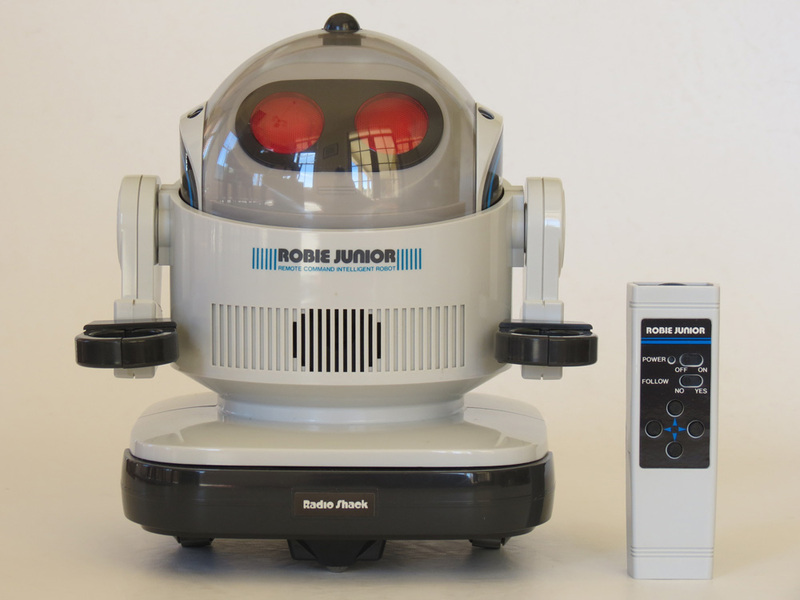 Robie Junior is a bot somewhere in the middle – ready for fun, able to be controlled (but not programmed), but still more advanced than many of the other models. The remote control reminds me a little of the old TV remote controls of the 1980s – except it isn’t infra-red, it actually works via ultra-sonic signals. A pretty unusual method for remotely controlling a toy, but it works ok and the signals can be picked up by the robot around corners (where infra red would not work). Although the owner’s manual does warn that “Robie may respond to the ringing of a telephone as the bell has ultrasonic level overtones”, so there’s still the risk of interference. 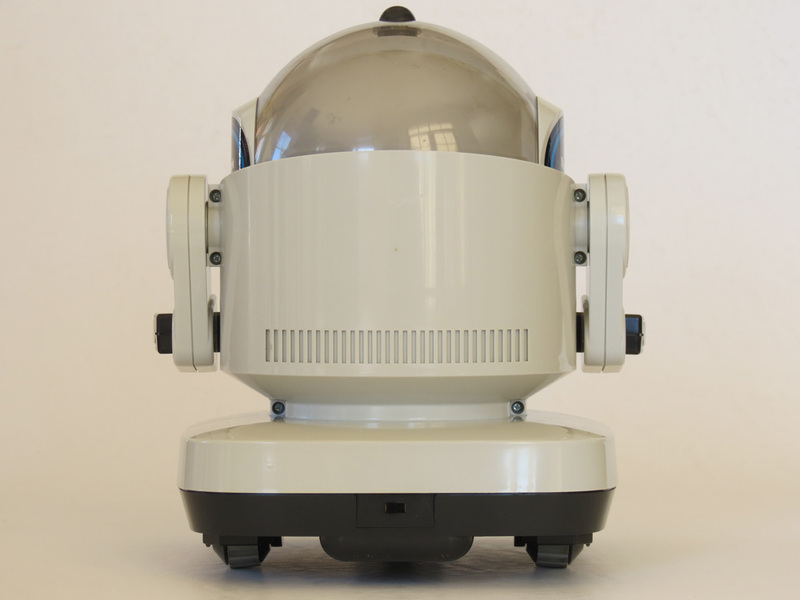 From the remote control, Robie appears to be mostly a straightforward R/C robot with the ability to drive forward, reverse, left and right. 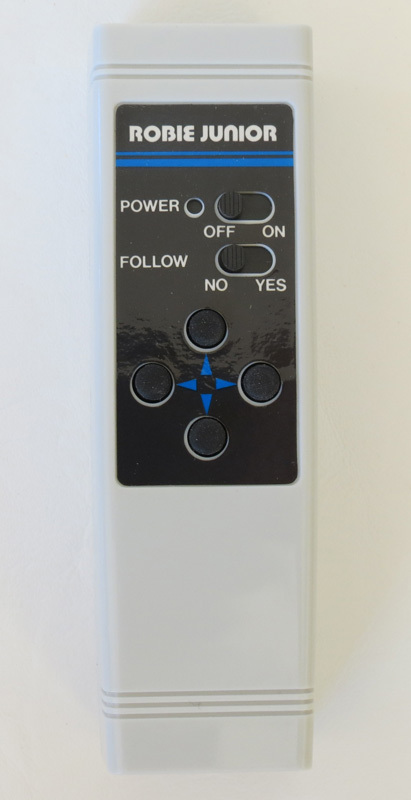 But then he also has the curious option of a “Follow” switch (YES/NO), and that’s where some of the novelty comes in. Switch it on, and Robie says “OK I’m coming” and will follow you wherever you go, triangulating the signal from the remote to figure out your location. Robie speaks a number of pre-recorded phrases that made him, for his time, pretty amazing. With the limited amount of on-board memory that he no-doubt has (hailing from an era when even desktop computers still had less than a single Megabyte), a toy with the ability to announce words without the use of something like an on-board cassette player, was a minor marvel. 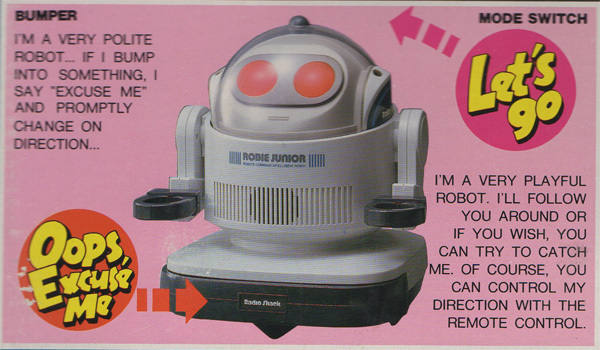 Most of Robie’s interesting functions are triggered by a combination of the remote, and other buttons and trigger points located on the robot. For example, the black knob you see on the top of his head is a button that (rather UN-obviously) switches him between two other modes – “stay” and “walk”. In “stay” mode he generally does what you want him to. But in “walk” mode, if you try to use the “follow” function, he may randomly decide to quit following you and will say “Catch me!” and try to run away by himself. Fortunately, he doesn’t move that fast. So provided you’re not 100 years old, you should be able to grab him. Other phrases like “Where am I?” and “That tickles!” can be triggered by combinations of modes and actions (such as pressing his arms down). When he bumps into objects, it becomes “Oops, excuse me!”, or “Ouch, that hurts!” depending on what level of control he’s under (the idea being that if he’s “mischievous”, he only cares about himself). In addition to all the vocal abilities, his movement is powered by rubberized wheels and his eyes light up as he moves and speaks. His hands can also grip light objects – they can be pried open like claws to carry things, or of course, you can simply fit his optional carry tray to have him transport something a little larger. His wrists rotate as well, which gives a bit more variety to the shapes and objects he can carry. 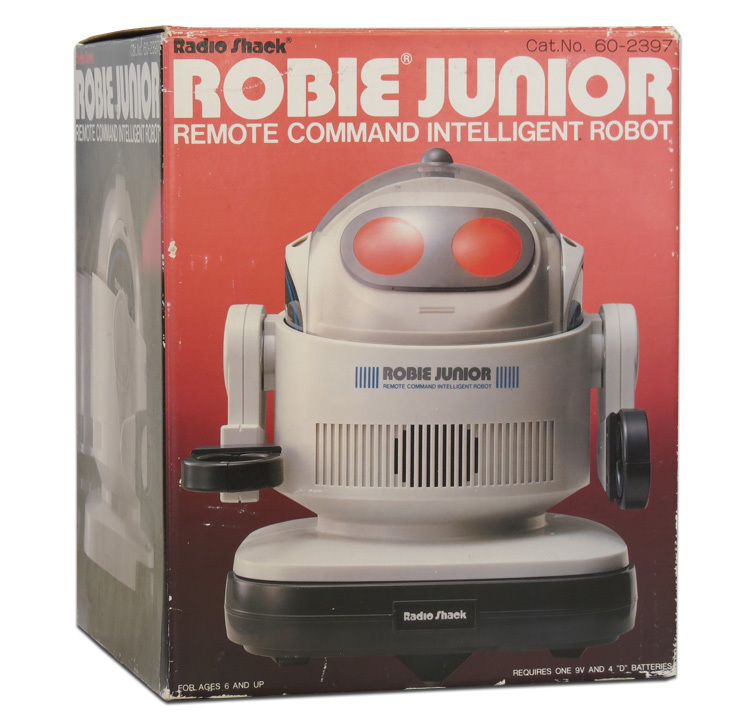 Today, it’s not too hard to find Robie Junior on the collectibles market, and they exist in all levels of condition. However, what is hard, is finding one in perfect condition. There are plenty of worn out, non-working ones out there. So prices can run into the hundreds for really mint examples. As with all vintage ready to run toys, most of them have been played with. Nevertheless if you’re nostalgic for 1980s robots, this one is a must-have in my opinion. Robie Junior is a real talking point whenever friends visit, as he’s probably one of the best looking toy robots ever made. Even today, he still looks a lot like how we imagine robots of the future are meant to look, and his smooth clear dome and white plastic somehow seems like a contemporary representation of artificial intelligence. Sadly, the NEC Papero has never been available for purchase by the general public, and has always remained a prototype. But it does suggest that the concept of Tomy’s friendly, short, round, wheel-driven little helpers of the 1980s was quite ahead of it’s time. 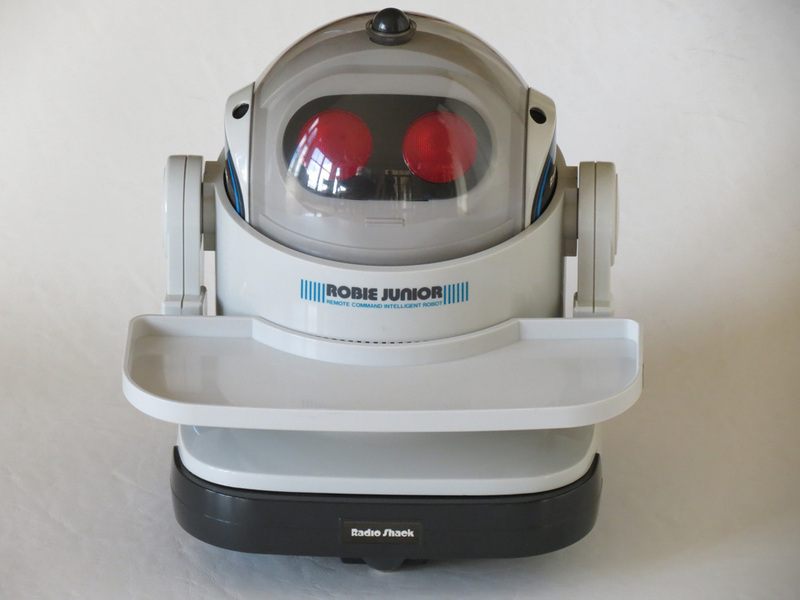 And Robie Junior remains fun to play with almost 30 years (can you believe it’s been that long?) after he was first released. Ah yes, the tank with the claw – that was in fact the Z-707 Battle Iron Claw 🙂 Look out for it here, in future. I also remember Robotix. Thanks for the nice comments Rob! I had one of these as a child. My father found a broken one in the discount bin at Radio Shack and fixed it up for me. It worked fine until it bumped into something above the bumper level, then it would gibber unintelligibly while spinning its wheels. It also had the unnerving habit of turning itself on randomly and saying, “C’mon, let’s play!” while moving a few feet in either direction. It was supposed to do this when powered on, probably to remind you that you’d left it on . . . but to do it when powered off, and those glowing red eyes . . . I was a little scared of it. Hi Rhonda – perhaps you could try taking the transmitter apart, and cleaning off the battery acid. This can be done with a flathead screwdriver, and some abrasive paper. It’s fiddly, but it might get your Robie working again. Failing that, you will need to wait to find another transmitter on eBay I am afraid. 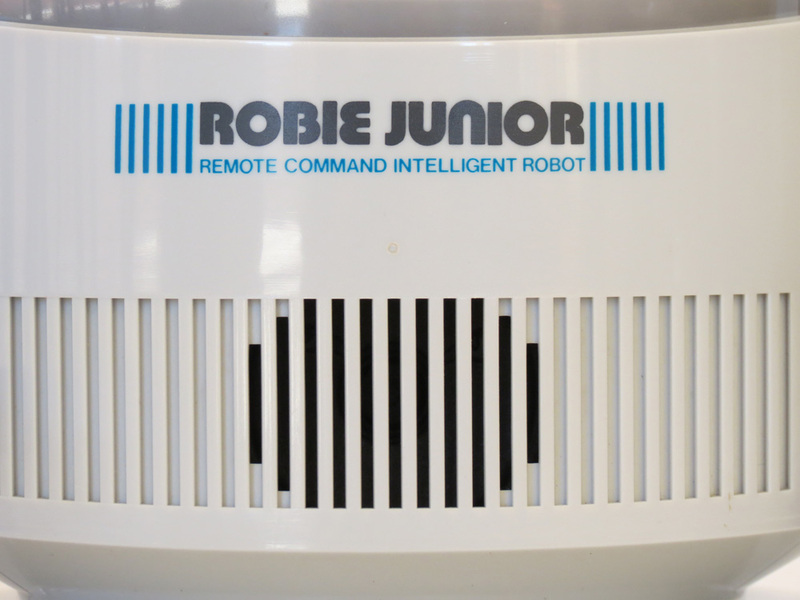 I have a remote for Robie Junior. I have no idea if it works, but it seems to be in great shape. Robie Junior used to belong to my daughter. How do I fix Robbie…? He is in mint condition…never left the batteries in…but when I put batteries in to test him…he comes on and says somethings but sparadic in his commands…He spins and says one thing…. It appears he needs to be cleaned?? How do I do this? Also not sure if My remote is working…? 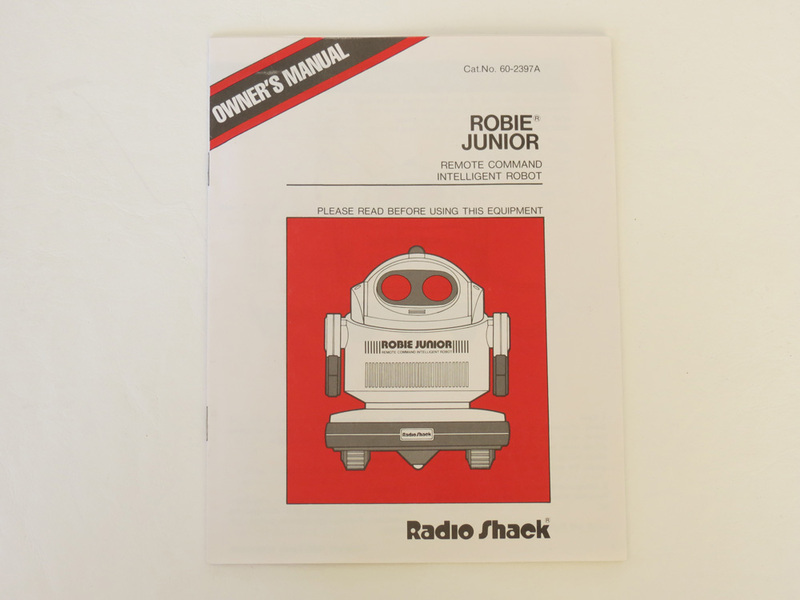 I’ve been looking for a service or repair manual for either Robie Jr, Omni Jr, or Omnibot Jr (all the same robot) but can’t seem to find anything for the Sonic receiver. Can anyone help me out. Thanks.